A decade ago, the United Worlds and Vorn were at war. Just as we never knew why they attacked, we never knew why they withdrew from U.W. space, but given the losses suffered, we were glad they did. The Vorn remain a weight on the minds of U.W. military planners, but life goes on for everyone else. From the domes covering the frozen wastes of Tawhirimatea to the lush jungles of Yewel, humans the other races of the U.W. live, work and squabble on dozens of inhabited worlds, deal with the ever-changing Jodoni demenses, wonder about the aloof, cryptically prescient Ethereans, and worry about what was important enough to the Vorn to have them retreat when their victory was nearly certain. 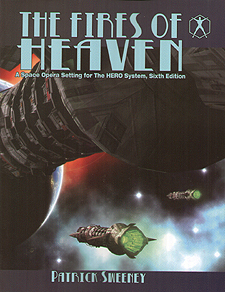 Fires of Heaven by veteran game designer Patrick Sweeney is a massive 258 page gameworld for the HERO System 6th Edition, with details on every aspect of the United Worlds, alien races, starship design and combat, psionics, and more.